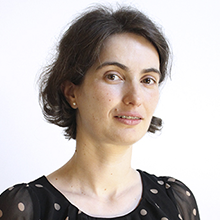 Elisabete Simões is the Programme and Administrative Services Officer at the United Nations University Operating Unit on Policy-Driven Electronic Governance (UNU-EGOV) since June 2016. Her responsibilities include planning, organizing, supervising and managing the delivery of the entire portfolio of administrative, financial, technical, communication and programme support services to the UNU-EGOV personnel and projects. Before joining UNU, she was a Resource Planning Coordinator, HR and Financial Officer at the European Medicines Agency, the EU agency for the evaluation of medicinal products, for 9 years. Elisabete Simões holds a Bachelor of Economics from the University of Coimbra, Portugal (2003) and a MSc in International Business from the University of London, UK (2012).